This is a sincere thank you for the beautiful book you gave [student] today--and, of course, the support and encouragement you've given her these past years as she worked through Wilson and her reading challenges. We are blessed to have you enter our lives at just the right time. 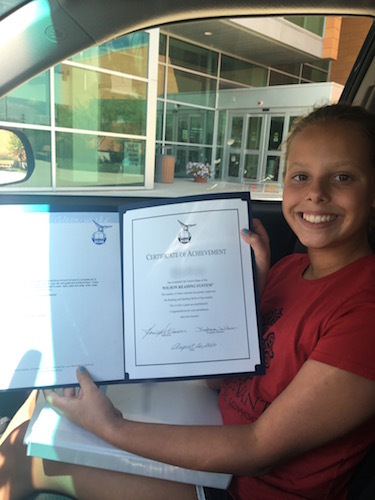 I was reminded of this while speaking to [prospective student's mom] at the pool on Sunday afternoon as she shared her concern about how to help her daughter who was recently diagnosed with dyslexia. I remember that overwhelming fear as a parent and the uncertainty of what to do. Thank you, Kim. Thank you for the work you do. It matters. [Student] is growing into a confident young lady, and you are a part of that growth. [Student] keeps saying, "Mom, tell her I'm going to miss her a lot!" 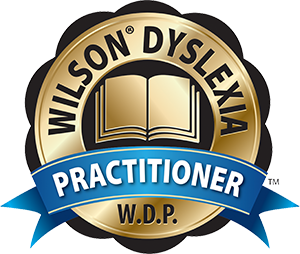 I have been teaching the Wilson Reading System™ since 2010 and hold a Level One Wilson Certification. I am also trained in Fundations™, Wilson Just Words™, and Wilson Fluency™. I strongly believe in the system’s effectiveness. I have experience with students diagnosed with dyslexia, ADD, ADHD, dysgraphia, and language and auditory processing disorders and work with twice exceptional (2e) learners. My students have made great strides in their reading, spelling, fluency and comprehension using this system. The Wilson Reading System™ is a multi-sensory program that teaches students how to fluently and accurately decode (read) and encode (spell). Based on Orton-Gillingham principles, it teaches word construction thoroughly, not just phonics. The ten-part lesson is inclusive of comprehension, sight word and vocabulary work. The Wilson Reading System™ is successful with students who have language-based learning disabilities, such as dyslexia, as well as those who are reading below grade level due to word-level deficits. Students are taught how to become metacognitive learners in the sense that they are able to show what they have learned. Most lessons include work in executive functioning and morphology. In October of 2015, I attended the Everyone Reading Illinois Dynamics of Dyslexia: Common Core in Action Conference in Schaumburg, IL. I learned so much and have been putting ideas and theories into practice. If you’d like to learn more about me, check out the blog section of the website! I have seen [student] grow by leaps and bounds this year in second grade! Thanks for your work with him. I'm seeing great results in his confidence in reading as well as his skills. When it comes to identifying digraphs, diphthongs, and phonics rules, [student] shines. Of course he always shines in discussions with his deep thinking. He has learned so much from you, and it shows in the classroom.